Iran unveiled its first home-made wide-body drone with a jet engine in an exhibition held by Armed Forces in Tehran, Fars News Agency (FNA) reported. The Iranian experts have omitted hydraulic system in the plane and replaced it with electromechanical operators. The Iranian Armed Forces showcased their latest achievements and products, including new drones and weapons, in “Eqtedar 40” exhibition in Tehran last week. 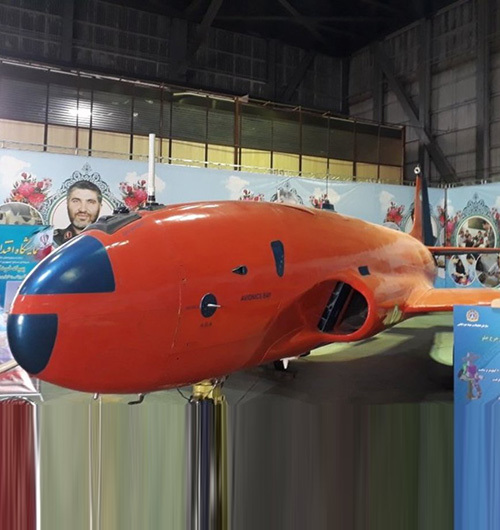 Iran’s newly developed drone named Kaman 12 with flight durability of 10 hours, 200km speed, operational radius of 1,000km and capability to carry 100kg of cargos was unveiled in the exhibition. Other achievements displayed in the exhibition include Akhgar missiles mounted on Iranian drones which can hit targets 30km in distance, Qassed 3 cruise missiles carried by F-4 fighters with the capability to destroy targets 100km in distance, air-based Shahin drones with jamming capability which can be mounted on fighter jets, a new version of Shahed 129 drone with the operational range of 2,000km, flight durability of 24 hours and capability to conduct patrolling and reconnaissance operations and destruction of targets with bombs and missiles, RQ-170 drones, Saeqeh-2 drones, which have already been in missions against the Takfiri terrorists and their leaders in Eastern Euphrates region in Syria, with the capability to carry smart bombs, and Mohajer-6 drones, equipped with home-made Qa’em missiles. In November, Commander of the Islamic Revolution Guards Corps (IRGC) Aerospace Force Brigadier General Amir Ali Hajizadeh underlined his country’s major advances in designing and manufacturing different drones.